Regardless of whether it is fascist, communist or capitalist, all governments hate Franz Kafka. Kafka, despite his reputation as a depressing malcontent, was an honest humanist. He didn’t belabour the philosophy, he just lived the life. Two stories from his real life stand out which show his basic decency. These are told by other people, for Kafka did not blow his own horn. However, I suspect he did not even think he had done anything special. When Kafka first met Oskar Baum, who became a lifelong friend, he bowed his head when he shook hands. This was the formal custom of the day. Oskar felt Kafka’s hair graze his head, which was the only way he could tell that Kafka bowed, because Oskar was blind. To Kafka, the fact that the other man was sightless was no reason not to treat him with the full dignity he would express to any other. Later in life, Kafka worked as a lawyer for the Worker’s Accident Insurance Institute for the Kingdom of Bohemia in Prague. This organization was an odd blend of a government and private insurance ‘company’, that paid benefits to injured workers. 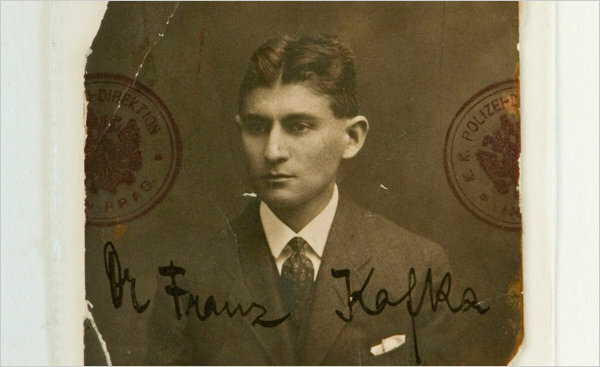 Although Kafka’s main job was as an administrator, he did sometimes find himself representing the Institute in a court of law. On one occasion, he was acting against a worker who was refused benefits for an injury. Kafka believed the worker deserved his benefits, but he would do no less than his best to win the case. His solution was to, from his own pocket, hire an excellent lawyer for the worker. Kafka put forward the best case he could, yet lost. He was greatly pleased.